*Nice apartment with swimming pool in Fenals, Lloret de Mar. 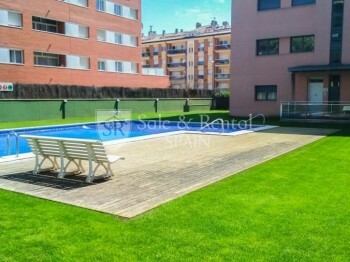 The flat is a ground floor with terrace and a private garden of about 50 m2, which gives direct access to the communal area and the swimmihng pool. It has a total of about 65 m2, with a hall, a living room with access to the terrace and a kitchen. It also has 2 bedrooms with fitted wardrobes, one of them with en suite bathroom and another bathroom. It has cold and heat pump and option to acquire a parking space. Located in the area of Fenals, with services on foot and the beach a few meters away, it is a quiet area of the town of Lloret de Mar. Do not hesitate and come to visit without commitment.